In Latvia, a flat country overlooking the Baltic Sea, the climate is freezing in winter and mild and quite rainy in summer. The coastal areas are a bit more temperate, but also more humid and windy, while the eastern area has a slightly more continental climate. On the west coast (see Ventspils, Liepaja), the average temperatures are just below freezing in January and February, and around 17.5 °C (63 °F) in July and August. Here is the average temperature in Liepaja. 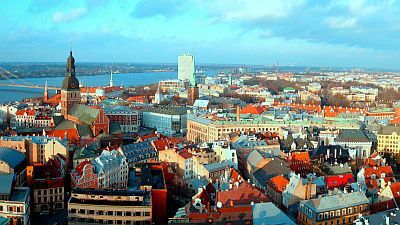 The capital city, Riga, is located on the coast as well, but in the Gulf of the same name, which is closed and therefore receives a less pronounced maritime influence, so much so that in winter the sea can freeze. Here are the average temperatures of Riga. Precipitation is not abundant, but it is frequent and well distributed throughout the year, however, in terms of quantity there's a relative minimum in the early months of the year. The coast is rainier than the interior: in Liepaja precipitation amounts to 690 millimeters (27 inches) per year, with a maximum in autumn, while in Riga it amounts to 620 mm (25 in), with a maximum between July and September (also due to afternoon thunderstorms). Here is the average precipitation in Riga. Winter in Latvia is cold and gray, with frequent snowfalls, though usually not abundant. Average temperatures are not so low on the west coast: the daily average in February is around -1.5 °C (29 °F) in Liepaja and -3 °C (27 °F) in Kolka (at the entrance of the Gulf of Riga), while it drops to -5 °C (23 °F) in Riga and to -6 °C (21 °F) in Daugavpils and Kraslava, in the south-east. However, the average temperatures are only the result of different situations: western currents of Atlantic origin are damp but less cold and can raise the temperature to a few degrees above freezing (0 °C or 32 °F), while cold air masses from Russia or from the Arctic may lower the temperature even below -20 °C (-4 °F); in the worst moments, the temperature can plunge to about -35 °C (-31 °F). Spring in Latvia is quite late: in early April, the country may still be under the snow. By mid-April, temperatures become usually milder. In May, the weather can still be cold, especially at the beginning of the month, but then the temperature rises over the course of the month, and it even exceeds 20 °C (68 °F) in the warmest days. Summer is mild in coastal areas, with highs around 18/20 °C (64/68 °F), while it is slightly warmer in the interior, where maximum temperatures reach 20/22 °C (68/72 °F). Summer is also the rainiest season, especially in inland areas, where thunderstorms may occur in the afternoon. Sometimes, warm air masses from the south-east can raise the temperature, which can approach 30 °C (86 °F) for a few days. In autumn, rainfall is frequent and the sky is often gray. The temperature gradually decreases: in October it's already cold and in November the first snowfalls occur. The sun in Latvia is rarely seen from November to February, while from May to August it shines for a decent amount of time (the days are very long, so the total sunshine is not low). The Baltic Sea in Latvia is cold to swim in: in the Gulf of Riga the sea temperature is around 1 °C (34 °F) in February and March, while it reaches a maximum of 16 °C (61 °F) in July and 17 °C (63 °F) in August; on the west coast it is just warmer. Here are the average sea temperatures near Riga. The best season to visit Latvia is summer, from June to August. The temperatures are mild during the day, and lend themselves to outdoor activities, while nights remain cool. There is a moderate amount of rainfall, which occurs on average one day out of three. If you want to visit the country in its winter appearance, February is preferable to December because it has longer days, although it is even colder. In winter: bring very warm clothes, such as a down jacket, a hat, gloves, a scarf. In summer: bring clothes for spring and autumn, being ready to add or remove the outer layer, a T-shirt, but also long pants, a jacket and sweatshirt; a raincoat or umbrella.